Pedersen Roof and House Soft Wash cleans Mold, Moss and Lichen from your asphalt roof, preserving the roof from the damage caused by these growths. If allowed to grow on your roof, mold, lichen and moss will damage the bitumen in the asphalt shingles, as well as cedar shingles and significantly shorten the lifespan of your roof. Pedersen Roof and House Soft Wash has been in business since 2000 in this field. After much research, we now use specialized products we source from Wisconsin which do not require high pressure wash. In fact the use of high pressure will damage the roof, and has been known to void the warranty. We get calls from insurance companies where an insurance inspection has determined that a home has growth that needs cleanup. Our process takes some time, because its a gentle application causes no damage to the roof, but gently removes the growth. Results can be seen within 4-5 hours, but for the roof to come fully clean, it takes 2-3 weeks and some rain. We return after this time to check the progress on the cleanup, and almost always reapply in any heavily affected areas. Please call for an estimate and allow us to explain the process fully. A normal family home usually costs under $1000 for the full treatment including our monitoring to make sure the treatment is successful. You do not need to be home for us to complete the treatment, or even to prepare the estimate. 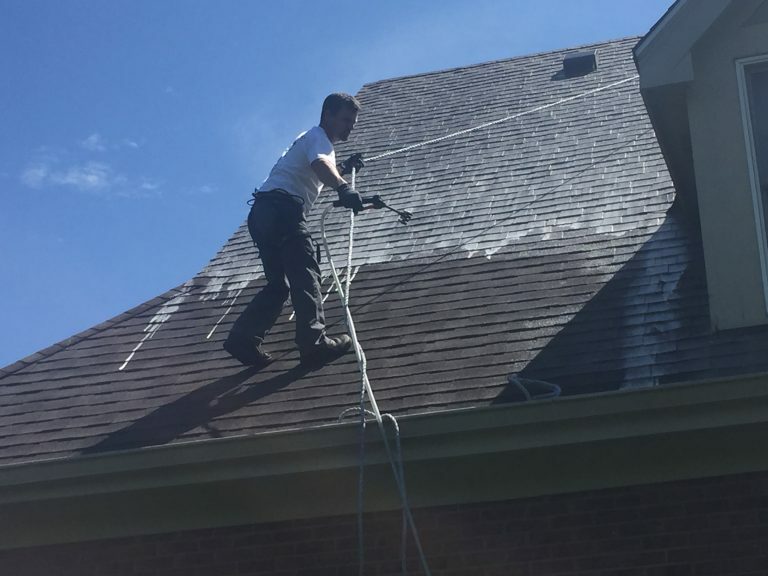 Where the roof cleaning is required by your insurance company, we have a form we complete and send in to them detailing the work done and any other information regarding the roof they require. Roof washing especially when the roof has overhanging trees is recommended every 2-3 years. We usually find the treatment lasts about 5 years without further treatment. Some growths are especially dangerous and may actually eat into the structure of the asphalt shingles and create holes which of course will allow leaks into the home, causing further damage. Our Soft Wash product is natural and very diluted. We take special care of landscaping and plantings around your home, making sure to protect, and then rinse them several times immediately after washing the roof.